You are here: Home / Being Human / Is it selfish to focus on living a happier life? happiness is only beneficial to one person. The truth is quite the opposite though. Living a happier life is one of the most helpful things you can do for others. In fact, being happy is incredibly unselfish. When you live a happier life, you benefit everyone around you. So, how can working towards a happier life for ourselves be unselfish? How can doing that help others? In short, the answers to this are many. A crucial one though is found within some key components that make for greater overall happiness. Accepting that for the moment, what does it feel like to be around someone exhibiting these qualities? How do you feel when someone shows they are very grateful for something you’ve done? What does it feel like when the person you’re interacting with is fully engaged with you? How do you feel when someone acknowledges your feelings and circumstances? What does it feel like when someone gives you the benefit of the doubt? How do you feel when someone does something nice for you for no real reason? What does it feel like when someone does something for you that improves your life? When we are around people being grateful, mindful, and compassionate, we feel better. They make our life feel more rewarding, and they bring some happiness into our world. In short, we benefit when someone else is grateful, mindful, or compassionate and kind. These qualities — gratitude, mindfulness, compassion and kindness — are ones that a person actively cultivates in order to live a happier life. At the same time, they are also qualities that bring happiness to the lives of others. In other words, to live a happy life, we cultivate qualities that bring happiness to those around us. That means a big part of living a happier life comes from doing good for others. Furthermore, the process of cultivating these qualities involves considering how we can benefit those around us. This leads us to think even more about how to help others. 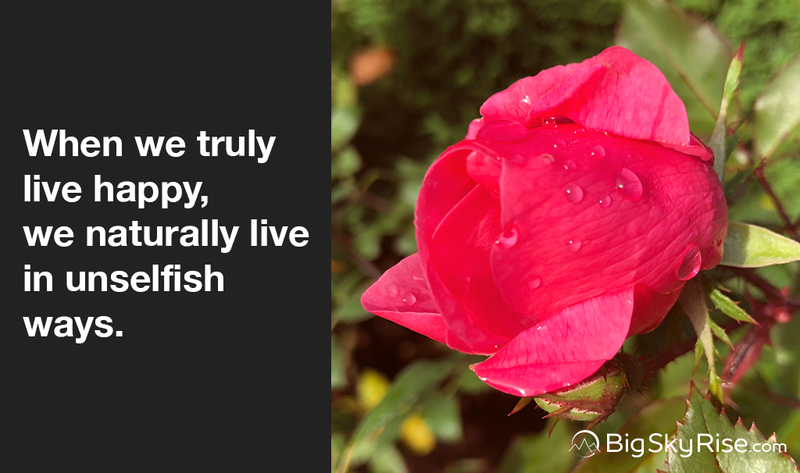 So, is it selfish to focus on living a happier life? A big part of cultivating a happier life involves working to improve the lives of others. It means being more considerate of them. It means being more grateful for them and all they do. Further, when we live a happy life, we naturally do good for others in countless other ways. No matter how you put it, improving the lives of others, considering others and doing good for others is a helpful and unselfish act. You are not selfish for wanting to live a happier life. In fact, living a happy life is an unselfish and helpful act. It’s good for others, as well as yourself. Recognize this, and give yourself permission to live a happier life. Living a happier life is an unselfish thing to do. Part of what goes into living a happy life is doing things for others. Living a happy life shows we are appreciative and grateful for everything we have. When we are truly happy, we help help others live a happier life. Living a happier life helps other people. Consciously acknowledge that learning to live a happier life is an unselfish thing to do. Give yourself permission to live a happier life. Start living your happier life.